Biologi is a revolutionary range of serums breaking the mould in natural skincare. For those not familiar with the science behind Biologi, here’s our A-Z of natural skincare. Active ingredients are those which have been scientifically proven to change the skin at a cellular level. The higher the activity of a natural product, the more noticeable and longer lasting the results. You can read more about actives in skincare here. Biologi serums are the first skincare products in the world that are 100% active. The skin is the body’s largest organ that protects the body from toxins and pollutants. The healthier the barrier function, the better the protection. To have healthy cells, you must cleanse a minimum of twice a day, ideally three times (double cleanse at night). Choose a good quality, ethical cleanser that suits your skin type to use in conjunction with your Biologi serum of choice. Davidson plum is the botanical source of Bd – Luminosity serum. Chosen because of its natural hydrating properties, the phytol nutrients in Davidson plum work in synergy to reduce redness and inflammation, provide anti-oxidant protection from damaging free radicals and create an even, luminous tone. The tartaric acid in Bd serum breaks down the protein which creates dead skin cells from the inside to provide an enzyme exfoliation that keeps skin cells clear with every application. You can read more about exfoliation here. Finger lime is the botanical source of Bf Hydration serum. Designed for full body or use on the face, finger lime contains tryptophan which is an amino acid that helps to repair the damaged dermal layer that causes the symptoms of sensitised skin. Natural nutrients in finger lime also help to hydrate, reduce damage caused by overexposure to the sun, protect against damaging free radicals and reduce cellulite and dimples. Gallic acid is a phenolic acid found in Bd and Bk serums. The phytoactive works to reduce the signs of ageing including fine lines and wrinkles, reduce the visibility of sunspots, and reduce dark circles under the eyes. Skin cells are naturally designed to hydrate themselves from the inside out. A water-based serum will penetrate the deeper skin layers to promote the natural hydration processes on a cellular level. Inflamed skin can be caused by many conditions including eczema, acne and harsh synthetic ingredients used to formulate products. Calm inflammation and redness with active ingredients that protect and heal the skin at a cellular level. Kakadu Plum is the fruit source of Bk serum chosen because of its potent natural plant-based vitamin C content. Kakadu plum is used to reduce the visible signs of ageing, reduce pigmentation and reduce dark under-eye circles. Layering serums will combine the natural actives in each extract and reduce the efficacy of your serum. Use one serum at a time. If you prefer to use more than one serum, use one in the morning and one at night. Moisturiser contains synthetic emulsifiers which can cause occlusion (blockages) in pores. When choosing a moisturiser for your skin, always read the ingredients and understand how they can impact your skin and enter the system. Naturally-derived is a common term used to describe skincare, but it doesn’t always mean natural. A naturally-derived ingredient can be laced with synthetics and diluted with water and still labelled as naturally-derived, which can be misleading. As conscious consumers, organic is the buzzword for what we put on and in our bodies. In skincare, organically certified products may contain up to 30% synthetics so be wary of labelling claims and always research products. Perfume and fragrance, even those that are naturally occurring are known skin irritants that can cause further damage to a sensitive dermal barrier. If your skin is showing signs of sensitivity, consider removing fragrance to give cells chance to repair. Quercetin is a naturally occurring flavonol present in Davidson plum, Bd serum extract. Quercetin reduces redness caused by inflammation, helps skin recover from overexposure to the sun and is a potent anti-oxidant protecting and repairing cells from free radical damage. Ross Macdougald is a formulating chemist, Biologi’s founder and the creator of the revolutionary extraction system that provides single plant ingredient serums from plant to bottle. When skin cells are first exposed to active ingredients, they may go through a purging process which is the expelling of toxins. This may lead to spots, breakouts or a sticky texture on the skin that can last between one day and two weeks. In many cases, it may not happen at all. This is a short-term effect of using actives to treat skin on a cellular level. Tartaric acid is a fruit acid found in Davidson plum that works as an enzyme exfoliant to help keep pores clear from blockages caused by sweat, bacteria, oil, and dead skin. Tartaric acid is key to reducing the visible signs of acne such as breakouts and redness. UV rays are present in the sun and ongoing exposure can increase the signs of ageing and may cause cancer. To protect skin cells from harmful UV rays, apply sunscreen every day before makeup and after your Biologi serum of choice. Vitamin C is notoriously unstable once extracted from its natural source so must be enhanced in a lab to create synthetic ascorbic acid or L ascorbic acid. 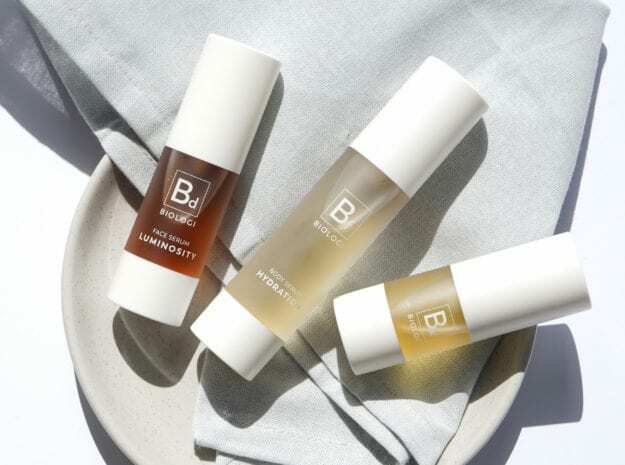 Due to our revolutionary extract system, Biologi serums are currently the only serums in the world that contain natural, plant-based vitamin C, keeping the potent anti-oxidising and anti-inflammatory properties intact from plant to bottle. Water or aqua is one of the most prominent ingredients in traditional skincare products. When water is mixed with naturally occurring ingredients, while it may make them stretch further, the process also dilutes the actives, and therefore their efficiency. To find out more about the science behind Biologi, follow us on Instagram!